Ir. Ardy Suhaidy Mustapha (Assistant General Manager - E&M Building Services of MRT Corp) at our ASEAN M&E REVAC booth to witness the RUSKIN (USA) TUNNEL DAMPER. 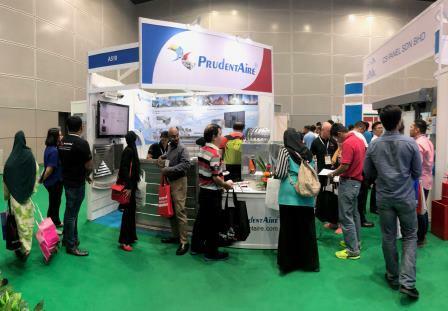 Big thank you to all visitors to our ASEAN M&E REVAC booth from 17-19 JULY 2018 at KLCC Exhibition Hall. Johnson Controls Inc. (Parent company of Ruskin/Titus) recognized PrudentAire through subsidiary Pro Aire Marketing Sdn Bhd for an excellent sales contribution of Ruskin/Titus products in Asean region for year 2017. MMC GAMUDA KVMRT (PDP) SDN BHD has visited on 26th September 2017 to our factory premises. The Engineers vetted the project specifications for Mass Rapid Transport project line 2. From Left to Right – Mr. Mohd Fizree, Mr. Ivan Lim, Ir. Mohd Zulkifly Emran, Mr. Gordon Lai, Mr. Teh Tze Huai, Mr. Kuan Lin Jie, Ir. Chen Fun Chien, Cik. Nur Shaira Azahari. Mr. Darren Webster Technical Manager – Fire Safe UK during his visit to Malaysia for product sharing session meet our client Mr. Rob Fox MD of Ocean Air Services with his team engineers. New product Caswell Firesafe® Fire rated duct work as per BS476 part 24 for 4 hours.